Here we plan to compile an archive about Troutbeck's ancient origins, together with memories and pictures of its more recent past. We're keen to gather contributions from anyone who has some historic material, old photos or cuttings, or just reminiscences to offer. 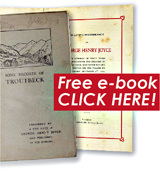 Some Records of Troutbeck This historic book was first published in 1924, in memory of George Henry Joyce, who was Troutbeck’s much-loved schoolmaster and organist for over 40 years, and collects together many of his historic documents and papers. These give a very detailed and evocative account of our village and Jesus church through the centuries. To download, read and print your own free PDF copy of this unique 76-page book – just click here. Troutbeck Church History This little leaflet was published in the 1930's, and gives another excellent summary of the origins of Jesus Church. The cover sketch is particulary nice. To download your own free PDF copy, click here. Mayor Hunts Bi-Centenary This booklet was produced in 1980 to commemorate two hundred years of Mayor Hunts in Troutbeck. 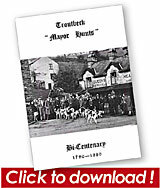 To learn all about the solemn responsibilities of Troutbeck's Mayor, click here. Since I can remember machines have mowed the meadow grass for hay-making, but father used to tell of the days when farm men had to be pretty handy with a scythe, the blade of which might be as long as six feet. Father won many a wager for mowing grass this way, and he could cut a swathe four feet wide and a yard forward. You'd have a job to find a man who could cut such a swathe to-day, and he’d have to be a gay strong chap. Scythes are now ornaments more or less. Part of the secret was in keeping a keen edge to the blade. A new edge was put on by the grindstone, and then the men kept sweeting up the blades with strickles. These were square pieces of wood, pitted with small holes. The usual way of making the holes was to tap the wood agains the teeth of a saw. Some hard sand was mixed with fat and smeared on the strickle. The sand lodged in the holes and was held there by the fat. It was just the thing for fettling up a scythe blade. There'd be two or three men mowing at the same time, one behind another, and they had to be careful where they put the blades so that nobody was injured. The old farmers of those days used to drive their men hard. I knew a man who had a two-acre field, and he sent two of this men to mow it before breakfast.They hadn’t quite finished it when breakfast was served, and the farmer was very scornful of their efforts! We’ve machines for everything nowadays. But when I was young we even had to scale the hay by hand, and weren't allowed to have forks. I’ve been so stiff through bending down that I’ve hardly been able to walk downstairs next morning! Of course, we got extra help on the farm for haytime. A man hired for a month might get £7, with his board and lodging provided. There were hiring fairs for farm labourers at Kendal and Ulverston, and when I was young, men were being taken on for half a year—to be worked hard at that—for as little as £6. The horses were the kings of the meadows, and the best of them stood between 15 and 16 hands high. We once bought a good work horse, maybe 10 years old, for £12. Horses were getting past their best when they were 20 years old, though I’ve mown with a horse that had celebrated it 30th birthday. During haytime a horse had to be humoured a bit and taken good care of; the machine mowing would start as early as three or four o’clock so that the work was done before the day hotted up, and it might be eleven o'clock at night before the horses were finally taken our of harness and allowed to sleep. Haytime can provide some very hot work. I remember when five of nine gallon barrels of beer were brought from a brewery at Kendal for haytime drinking. The best beer cost a shilling a gallon, but haytime beer could be bought for eight-pence a gallon. It was taken to the fields in stone bottles, and the men drank as much as they wished. Occasionally a man would be drunk, and one man I knew got the sack because his boss found him asleep in the field. He’d imbibed too much. Those were the days when a good deal of beer was home-brewed. Why there was an Inn down in Staveley—it was called The Fat Lamb, but it’s gone now—where George Cannon served home-brewed ale. It was good stuff, too. You don’t hear any corncrakes in the fields nowadays. There were a lot of these birds at one time, and they used to be calling well into the night. I don’t remember finding a nest, but they loved the meadows, and occasionally I’d see them running fast through the long grass. If it were not for a rummage sale which is organised every other year, the Institute in Troutbeck would be in serious difficulty—and I suspect that other halls and institutes in Lakeland have monetary worries. Our Institute was built, according to the deeds, in or about 1872. The original plot of land was given by Admiral Wilson, of the Howe, in 1867, and a further piece of land was given by the late Mr WG Groves in 1908 for a caretaker's cottage. Stone for the original building was carted to the site by the inhabitants of Troutbeck—in their spare time. And on a whole the building has stood up to all those years of wear and weather remarkably well. It is in a much better state than its finances! In 2008 the Troutbeck School building was gifted by the Church of England to the Anchor Housing Association who have converted it into the two lovely homes which now stand opposite Jesus Church. Troutbeck School had an ancient foundation in 1637. By a piece of good fortune, exact details of the building specifications and names of the builders still exist. £5 a year was allocated to pay a master to instruct in ''English, Latin, Greek writing, Arithmetick and good disciplining" for which the parents paid sixpence a Quarter, although poor children were taught free. 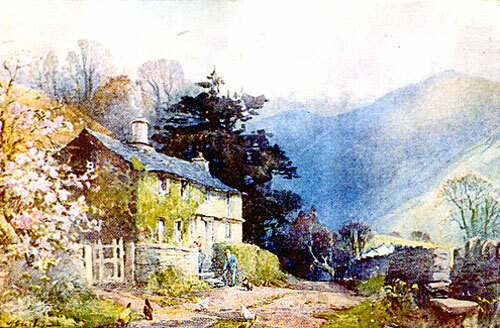 During the reign of Charles II, all the teaching became free, making Troutbeck one of the first free schools in the country. In 1760 a stable was built at the school for the use of those who came to church on horseback. The school was rebuilt in 1853, and then at a cost of £258, raised by public subscription and a sale of work, in 1885 it was approximately its present size. In spite of opposition from parents and interested people in the village, the school, after 350 years, was finally closed in July 1975, the children being transferred to Goodley Dale and Windermere Junior School. The building was then leased to Troutbeck General Charitable Trust. At a meeting of Trustees of the Parish School held in the school room on April 20th, 1883, it was agreed on the suggestion of the Rev C Townley, that the followling prizes should be presented to children for good attendance at sohool: Over 380 attendances for the year, a 2s book, over 400 attendances a 3s book and over 420, a 4s book. In the examination of Religious Knowledge, held by the Examination Committee of the Diocesan Educational Society, when 14 childred from the parish school wer presented, the trustees heard that only Annie Millray, (age 12) obtained a seoond class pass and a 10 children received a third class pass. It was deemed that the present school room now accommodattd 87 children and was much overcrowded. It was noted that there were 742 books in the sohool library and the £1.11.0d taken in subscriptions from borrowers was expanded as follows:- Bindings 17. 6d. Brown paper and sealing wax 1s 3d, books purchased 7s 8d, carriage 2s 7d , accounts 2s 0d. Total £1. 11. 0d . In the beginning of the year 38 books were bought with the proceeds of a concert, held on behalf of the school library. On 16th June, it was agreed that a flower service would beheld in the parish church at 2 o' clock, whereby children from the parish school and Sunday School, numbering 116 in all, would each carry a bunch of flowers to be blessed at the Altar rails and distributed later to the sick and poor in Kendal Memorial Hospital and in the workhouse. When I began school in the early years of this Century, there were over 60 scholars on the register, including some from as far as Low Skelgill and Thickholme. The earliest memory of my school life was the celebration of the Century of the Battle of Trafalgar on October 21st 1905. When I was about 11 years old, Mr Joyce took us one Saturday in summer on a sight-seeing trip to Liverpool. There were about a dozen of us, boys and girls, and we met early at Windermere station and proceeded by train. Few, if any, of us had visited a large city before and we had a very interesting time. Our biggest thrill was a trip on the Overhead Railway by the docks, where we saw the old Cunard Liner, Mauritania, which at that time was the largest ship in the world. When we arrived at Windermere at night we found to our pleasure, that Mr Joyce had hired a coach to take us home. Many parents and friends arrived to see the Presentation of the Prizes. A local brass band was hired and played selections during the afternoon and evening. We played various games, including races the full length of the drive. Later on most of the young people of the village enjoyed dancing on the lawn to the music of the band. This carried on until almost dark and a four in hand coach took the bandsmen and their instruments home. So thus ended a happy and joyful day in our school life. A few years before I left School a portion of the field next to the playground was fenced off and laid out in garden plots, then we were instructed in the art of growing vegetables. We were allowed to sell the produce we grew, and got half the prooeeds for ourselves. On one occasion a man from the Horticultl1ral Society came to inspect our garden, and prizes of garden shears and pruning knives were given for the best plots. Just before I left school in 1914, we flew the flag at half mast on the occasion of the death of Mr George Browne of Townend, who had been a school manager for a great number of years. Just a few nostalgic memories of the dear old school, from where so many of us commenced our careers in life. Miss Blezzard was the Head Teacher at Troutbeck when I first started to attend school. My earliest recollection of something exciting was a concert held in the Institute. I remember being "Lavender Blue", wearing a dress of blue frills, and the Annual May Queen was also a great favourite with Maypole dances and the boys doing a sword dance, which was always a splendid sight. Miss Blezzard was very fond of music and dancing but it wasn't always appreciated by the boys. One morning we arrived at school to find the playground full of strange faces, rather lost looking, and, I expect, feeling very nervous. They were the first Evacuees. The school was partitioned off with room dividers. I thcught it was very exciting, the class-rooms were so full it was difficult to move around. The new children, who came from the Newcastle area, soon settled in and sone became firm friends, even to the present day. About that time we were supplied with Gas Masks, which we carried with us and had strict instructions never to go any-where without them. We also had tins of biscuits in case of Air Raids, but fortunately the only bombs dropped in the area, I believe about 12 , were at night at the head of the valley doing very little damage. They all fell in fields which we are now farming. In 1976, the Education Authorities decided the school should close due to falling numbers. People in the valley immediately realised that they did not wish for the school to be sold, and an alternative use must be found for the building. It was decided that it would form an ideal centre for visiting parties of school children, guides and similar groups in summer, and climbers and walkers in winter. 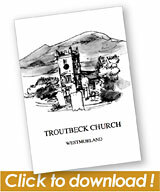 The Diocese, as owners, were approached, a lease was granted, and Troutbeck General Charitable Trust was formed. The next hurdle to overcome was finance to provide for the cost of necessary alterations, An appeal was launched and the possibility of grants investigated. In the event, the English Tourist Board gave £2,550 and the Appeal realised gifts and loans of £2,493. Conversion of the property to provide a self catering kitchen, toilets, showers, a large dormitory for twenty, and two small rooms for teachers and organisers. The cost of the conversion was £7,500 before the purchase of any furnitnre, kitchen eouipment etc. In this respect, the school was very lucky. Bunk beds for 24, tables and chairs, two cookers, crockery, and pots and pans were all given, and the first lettings took place in 1977. The school was extensively advertised to education authorities, guides, ramblers, and ancillary groups. Unfortunately, the period of lettings was disappointing, not because of lack of interest, but due to non-payment of a substantial account. However, lessons were learnt and it was soon realised that, given time, it would be a success. 1978 was the first full year the school was open, and it was encouraging that for the period of May to August there were very few weeks when it was vacant. The policy was to encourage parties to rent the school for a week and they were charged by the number of people in occupation each night. In addition, many parties like to rent for just the weekend and a minimum charge per night was introdured. One of the benefits of the school to the people of Troutbeck was that when profits began to materialise, donations could be made to the Church and the Institute. Expectations were more than realised when the first donations could be made towards the end of 1978. The school has continued to thrive, and over the last few years it has always been fully booked for the months of May to September. During this period the furniture and kitchen eouipment has been extensively renewed, and only last week ten new bunk beds were purchased to replace the originals from 1977. In addition, the donations to the Church and Institute have been increased, and it was pleasing that a substantial sum could be given to the Institute in 1982 to help with the cost of the roof repairs. The success of the School could not have been achieved without a great deal of hard work from the people of Troutbeck, especially Mr. D. Scott and Mr. C. Storey. It was Mr. Scott's ideas and enthusiasm that launched the project in the first instance, and Mr. Storey puts in a great deal of time visiting the parties when they ocoupy the school. 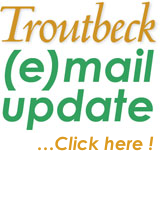 It is thanks to them, and many others, that Troutbeck School flourishes as it does today. I was born at Robin Cottage, Troutbeck on July 18th, 1907. My mother, Margaret Frame, came from Dalmany, South Queensferry, Scotland. She used to work in the laundry at Holyrood Palace and often ironed King Edward's clothes. Later she came to work for Mrs Hanmer and Miss Jones who lived at Glenside. My father was Christopher Millray – his family all lived and farmed around here. Dad became the first roadsweeper on Kirkstone Pass, walking every day over to Patterdale. After that he worked at Cringlemire as a gardener for the Martin family, until he retired. My grandparents lived next door to us in Robin Lane, and even after ninety years I still enjoy living here. When I went to Troutbeck School, Mr Joyce was the headmaster, and there were over 90 children attending. A lot of them were from the quarry families. There were three classes, and my Aunt Alice was one of the teachers at that time. There were no railings outside the school as no cars were here then, so we all played out on the road or the Moss. When the first World War came, Tom Bland ploughed up the Moss, and we all planted it with potatoes to sell for our war effort. We also collected white moss, to send to the hospital to help cure wounds. The best white moss grew over at Limefit, on Garburn. We had a big coke stove and coal fire to keep us warm. All the children used to take a bottle of cocoa each, which we put in front of the fire to warm for our dinners. During the war, Tom Black came every day with fresh bread and butter for dinner as well, which cost 4d a week. Mr Grimble Groves, Mr Dean and Mr Dunlop were the school managers then. Mr Dunlop used to come every Monday morning to hear prayers said in school. Every year he used to give us all a big party at his house, which we called the Howe Treat! The girls wore new dresses, then after we all played games, followed by tea on the lawn. The Windermere Village Band came along and when our parents came, we all enjoyed dancing. Mr and Mrs Dunlop had two sons, who were both killed during the first World War. Mr Dunlop later brought a peal of bells for Jesus Church in their memory, which are still used today. Our school always entered every year for the Mary Wakefield Festival. One year we were told we sounded like a car with its brakes loose! During Lent, the vicar, Rev. Sewell used to show us all lantern slides about the bible. One day at school, I got a prayer book given, the prize or being the best behaved pupil in school. On my way home, I got into a fight with Tommy Knowles, and he got my prayer book which then fell into the river. It was very fast flowing at the time, so it washed away, and was found several months later by a man fishing in Lake Windermere. It had got my name in it, so the man gave it to my Dad, as he knew him. The book was no worse, but I got a good hiding! Every Spring, the children were let out of school early, to go and help with the sheep clipping at Troutbeck Park for Mrs Leek. The men used to come from all over for the clipping. The lads used to roll up the fleeces, the women helped with the food, and us children scraped the 'taties. These were then boiled up in the orchard, in a big boiler with a fire beneath. When all the sheep were clipped, everyone had a big meal of roast beef, yorkshire pudding, new potatoes, pease pudding and jellies. We then cleared the barn, and all danced until 3 or 4 o'clock in the morning. As we walked home, dawn was usually breaking. In my schooldays, a coach and few horses used to run every night, with passengers, from Penrith to Grasmere. About half a dozen of us used to come home from school, then walk up to the top of Kirkstone pass for 5 o'clock, to meet the coach. The driver used to give us a slipper (a piece of metal) which we dropped down the side of the wheel to act as a brake going downhill, then when the coach got on to the level, we took the slipper off and ran to the next hill. We did this at every hill all the way to Troutbeck. The people in the coach used to throw us toffees, pennies and apples, which we all divided amongst us. If there was only one apple, we all had a bite out of it! On Saturday afternoons, we girls used to go to Mrs Slingsby's at Broad Oaks to sew little dresses for the Lanana Mission. I remember that she alway had a big box of slippers for us to wear, so that our shoes didn't dirty the floor. We also enjoyed a big Christmas Party at Broad Oaks every year. My grandfather used to be friendly with George Browne at Town End. He went along to carve patterns on the oak there, and I always loved to go with him, and try my hand at carving too. There used to be a big stuffed bull's head at the top of the stairs, also a stuffed black and white sheepdog in a glass case in the house. One day there was a knocking on the door, I went to see, and a woman was standing there in a slouched hat, old coat and clogs, with a basket on her arm. I thought she was a hawker selling cotton and buttons, so I said we didn't want anything today, thank you. She said she was Beatrix Potter, so I said come in, and left quick! The Youth Hostel used to be a private house which was owned by Mr Pikerin. He had a valet who was also the choirmaster at church. The house was all pitch pine inside, with a glass roof. One hot summer the heat of the sun on the glass set the house on fire, and it was burned to the ground. We could see the big blaze from our house, and Dad went to help by passing buckets of water until his hands got all skinned. Once Mrs Brown and Mam went to a Mothers Union at Kentmere, while Esther, Madge and I looked after our John and Jimmy Brown. They had found a tin of black enamel and painted their faces. We couldn't get it off, so they had to go to school for days with really black faces. During the war, Mother used to send me with a big basin to Hedley's, at Briery Close, to fill it with beef dripping for 3d. Mam used to cut a bit for each plate, for us to put on the fender to melt. We would dip our bread in it for breakfast, with a bit of 'Daddies' sauce on. Quite a treat in those days! The Bishop of Carlisle called to see our vicar, Rev Sewell, one day. He didn't know the vicar was also a farmer, and met him on the back lane, just when he was moving a flock of his sheep. On enquiring the way to the Vicarage, Rev Sewell sent him round the village on his horse and cart, which took a long time, so that by the time he did arrive at the vicarage, Rev Sewell was then busy with his church work, so he was none the wiser. 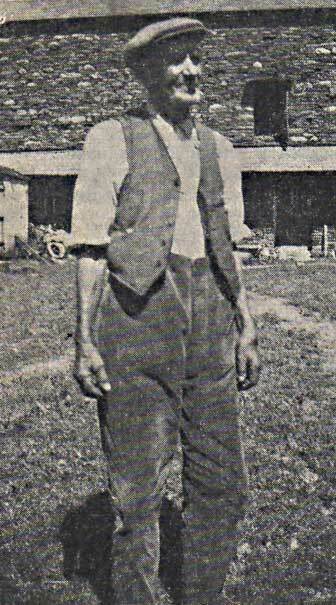 I remember Bill Hayton, a joiner at Town Head, also Tommy Grisedale and Arthur Bigland who were joiners at Syke Villa. Jim Bell had a blacksmith's forge there too, and as children we used to go and blow the bellows for the fire whilst he shod the horses. Arthur Mitchinson was the shoemaker, who repaired clogs and shoes for everyone in a little building near St James' well. Mrs Storey had a baby linen and underwear shop near to the Old Mission Room, and at one time Annie Storey had a sweet shop in a wood hut in a field which is now Town End car park. John Henry had a builder's yard at Buttment, and Mrs Bland ran the village shop. The coal men delivered fuel every week, bakers also came round from Windermere and Staveley. Once or twice a week, the co-op and fish men called on everyone. Tommy Peters also delivered paraffin and footwear. It was much easier to shop here then, than it is now. When I was a young girl, there were 24 farms here in these days, as well as all the tradespeople. Troutbeck was a very prosperous village!